This week we provide an update on the re-ordering and review of LHSA case notes. Recent activity has focussed on the case note index card series, which consists of 34 series titles and over 300 boxes. The index cards were originally produced as manual finding aids for patient case records, however because they have not been catalogued in detail, they have not been routinely used for researching enquiries. The case notes themselves are, for the most part, ordered by date or patient name, so searching them is usually straight-forward, but index card series can contain names of patients whose case notes are missing and be used to find names within a date-ordered series if the date of admission is unknown. The index cards had been re-housed into low acid boxes and labelled some years ago, so the first task was to look up handlists for the series which were written at this time. The series titles were reviewed and compared with existing case note collections and possible matches for them were identified. A sample of index cards was then tested to see whether patient records could be found using the information in the cards. In some cases it was clear that no case note collection existed for the index cards and in others only a portion of the index card series was relevant to a particular collection. The 20,000 case note collection catalogued as relating to Sir John Fraser was found to have index cards relating to it under both John Fraser’s index series for years up to 1944 and under Mr Graham’s from 1944-1946, presumably because Mr Graham took over those wards from Fraser in 1944. 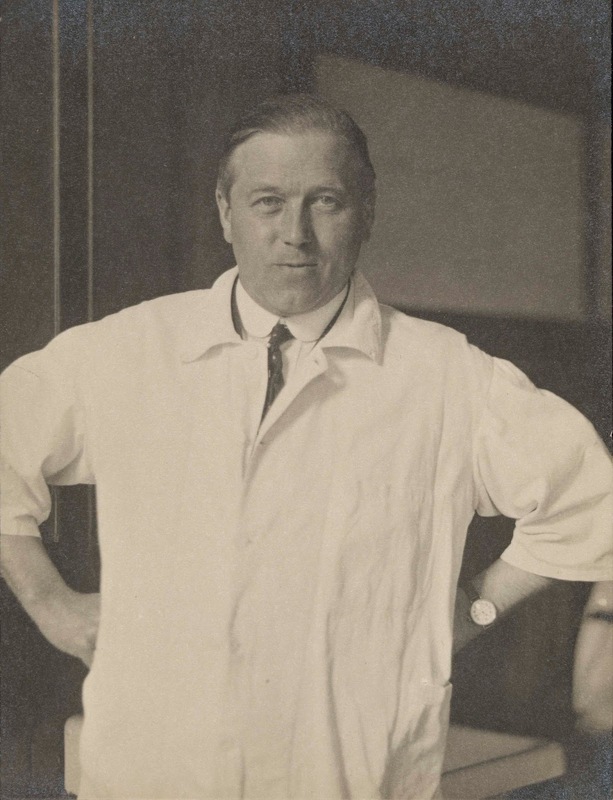 Sir John Fraser pausing from his work, c.1930s. The index cards are usually ordered by patient name and also sometimes by disease, which may be of use for researching the incidence of particular illnesses. In total, 15 case note collections have so far been found to have an index card series which relates wholly or partially to them. Those index cards which do not relate to case notes are still of some use, as they confirm a patient’s admission to hospital. Also included in the index card series are some out-patient notes which cover patients who had been referred from other hospitals. These are not strictly index cards and form a type of case note collection in themselves. This review of the index cards should greatly enhance the accessibility of the case note collections and enable LHSA staff to respond more efficiently to enquiries. Alas blog readers, this is our final joint blog for the LHSA. We’ve both had a tremendous time here. We have worked on very interesting projects and met some wonderful people. In this blog, we will tell you what we have achieved and what we have enjoyed in the past, very quick, 10 weeks. Since our last blog entry, I feel like the project has really taken off. There has been a lot going on in the studio, and it has been really exciting to see finished items building up. From research and speaking to other conservators I decided the most appropriate treatment for making the parchment title deeds more accessible was to flatten them using only the moisture in the environment rather than introducing any to the parchment. I have been trying different methods to see which is the most successful including pressing with boards, weights used locally and more unusually…with magnets! While the selected title deeds have been flattening I have been able to do other treatments. Iron gall ink was identified when testing several of the paper documents which influenced treatment greatly. 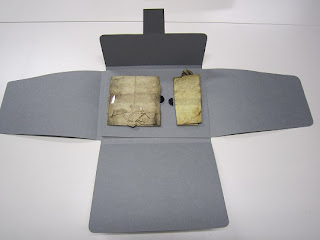 Documents were dry pressed and tear repairs were carried out using Gelatine (grade B) due to its potential to suppress the ink from corroding the paper. An important aspect of the project has been to create appropriate storage for the material. I have been making enclosures that give extra support to the parchment items, which will include protection for vulnerable seals. Something I am developing at the moment is a method of opening folded parchment items safely and securing them while viewing. Alongside practical work I have had the opportunity to develop skills in other areas. A couple of weeks ago I prepared a training day for four students who were interested in potentially studying conservation. The session included the introduction to conservation principles practical activities. It was fantastic to get the chance to do this, I enjoyed the day greatly and the students did really well. Training day participants with their beautiful folders! I can’t believe it is our final week next week. It will be a busy busy week as I still have plenty I would like to do. I have learnt so much from this internship and will greatly miss the project and especially the team here! In my last blog I had begun creating the catalogue on Access. This is going well now and I’m picking up the pace with more and more entries. I now have the whole of the Edinburgh Dental Hospital and School, the Royal Edinburgh Hospital and most of the Bangour Hospital photographs catalogued. In regards to the rehousing, you can see the photographs for yourself. Below you can see the before and after of the re-housing of some of the dental hospital and, photographed just this morning, the whole Dental Hospital photograph collection re-housed. 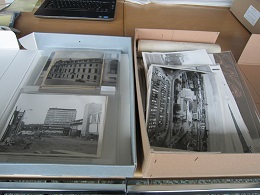 Completed Dental Hospital photo collection, re-organised, re-housed, re-labelled and ready to go! These past 10 weeks have been a great experience for me and I have learnt a lot from it. I have learnt how to archive whole collections, learnt about disaster management and basic conservation techniques. I have also visited some grand buildings and attended interesting lectures. For me, this internship has been, and will be, extremely useful for my future, I can only hope that the work I have done here will be of benefit to the LHSA. As with my previous blogs, I will finish it with a photograph. Some of you may recognise this one from the Facebook page, but now it’s going up on the blog because after 10 weeks of going through over 4000 images, this one is still my favourite. The Dott project on the road! On Thursday 7th March, LHSA’s Norman Dott case note cataloguing project took its first trip out of Edinburgh to attend the UK Archives Discovery (UKAD) Forum held at the National Archives, Kew. Together with my colleague, Clare Button, Archivist for the Towards Dolly project (cataloguing materials related to the development of animal genetics in Edinburgh), I presented a poster explaining the way in which the Centre for Research Collections has been working to open up history of science records to new researchers. Clare and I are both funded by the Wellcome Trust, and have been using the Encoded Archival Description (EAD) standard to create catalogues that reflect both the specialist nature of the scientific archives with which we work and the needs of the different groups of researchers who use them. EAD is based on eXtensible Mark-up Language (XML), ‘tags’ that allow text to be labelled and structured for online display. For example, the use of EAD in the Dott project allows me to highlight certain sections of catalogue descriptions for online searches and hide other information from public view that identifies patients. The UKAD Forum is a chance to hear current thinking on the different ways in which archives can reach new and current audiences through information technology, enabling them to link data on their collections with other institutions and provide better finding aids for the public. The popularity of the day proved that making archive catalogues available and accessible, promoting collections online and securing the future of digital holdings and electronic records are essential aspects of the archivist’s role in the twenty-first century. Clare and I heard presentations from those at the cutting edge of online delivery of archival material (Google Cultural Institute, Wikipedia, Europeana and the BBC’s Digital Public Space) to smaller archives building up their own online presence through the imaginative use of blogs, Facebook and Twitter. During our poster session, Clare and I answered questions related to our projects and made valuable connections with archivists around the country working with similar records and sharing similar objectives. All in all, it was a hectic but eye-opening day, and was wonderful to be in a position to tell fellow archivists about the work that LHSA is doing to highlight modern medical case notes as research tools. Fiona's photographic finds so far! In this blog I will tell you what I have been up to, my plans for the final three weeks, and some interesting things I have found in the collection. Since the last blog the catalogue is well on its way now with all of the Royal Edinburgh Hospital photographs catalogued and almost 1000 photographs catalogued all together. 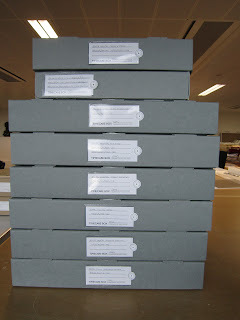 There was excitement in the office yesterday when our brand new ringbinder boxes and sleeves arrived for rehousing the photograph collection. I cannot wait to get started! 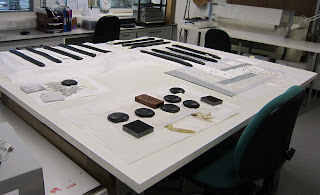 Earlier this week I was lucky enough to receive some help from a couple of our volunteers, Laura and Jessica, who conquered the mammoth task of arranging the Royal Infirmary of Edinburgh photographs ready for cataloguing. They were a great help and saved me two days of tough work! Below you can see a photo of their hard work. Please have a look at the photos below to see a couple of the interesting things I have found whilst sorting the photos. 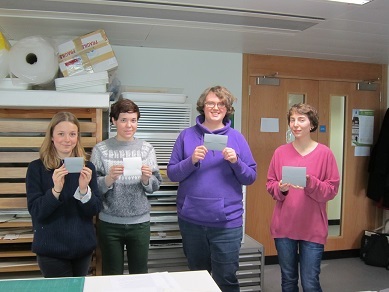 A few weeks ago, staff from LHSA visited Edinburgh City Archives. Archive intern, Fiona also joined us. We were met by Richard Hunter, Edinburgh City Archivist, who first of all took us out to the storage facilities in Murrayburn Road. These are shared with a well-known records management company, which looks after the City Council’s current records. The archives have been stored in a split-level electronic shelving system and archivist, Peter Clapham showed us around. 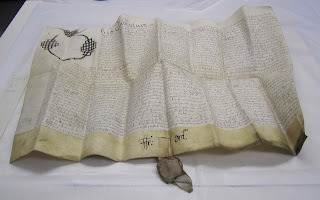 Some of the fascinating items that we were shown here included bailie court records from the 1720s and architectural plans of the Scotsman offices and the former North British Hotel, now the Balmoral. Peter also showed us that we could check if any of our ancestors had got into trouble with the law in Edinburgh during the 1870s - 1930s, from the police records. We didn’t find any familiar names, fortunately. Richard then took us back to the Edinburgh City Chambers where many other items are kept. 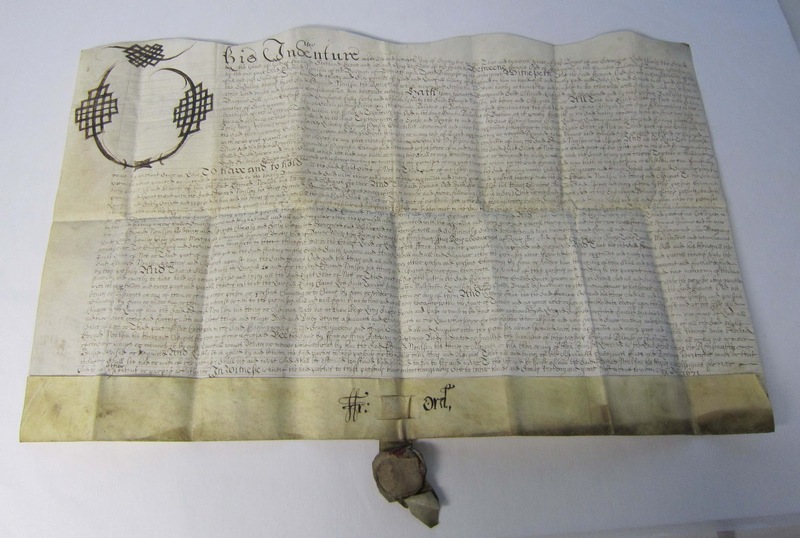 Our project cataloguer of the Norman Dott neurosurgery records, Louise, was delighted to be shown the record of Professor Dott being made a Free Man of the City of Edinburgh in 1962. This is an honour shared with Nelson Mandela and now Sir Chris Hoy. Some medical-related records which the City Archives hold are public health reports, including a case study of immunisation against smallpox from the 1940s, which as Richard explained, gained prominence in the wake of the terrorist attacks in the USA in 2001 for planning a public health response. Other items in the City Chambers which we shown were some of the fine collection of paintings and friezes, which grace the walls and rules for the first known golf tournament from 1744. Thanks to Richard and Peter for the extremely interesting tour – we saw an amazing amount of historical collections in one afternoon. 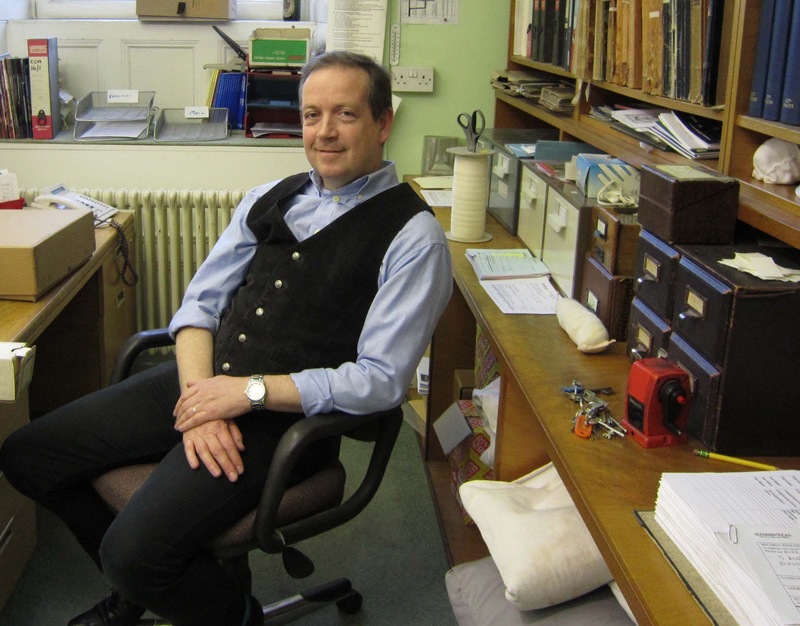 The photo shows Richard relaxing in the reading room near the end of our whirlwind visit.